Apple has launched an exciting "Breakout Books" promotion in its Australia and New Zealand iBookstores featuring thousands of Smashwords authors. This is the largest, broadest and most significant Smashwords-specific promotion yet undertaken by any ebook retailer. The implications are exciting for our authors and publishers. This gives thousands of Smashwords books a promotional advantage that would have been unheard-of in the old days of traditional publishing. It means that during this promotion, many Smashwords titles will enjoy some measure of promotional advantage not available to authors of traditional publishers. The promotional image at left shows the opening "Featured" page in the iBookstore, as viewed on an iPad for the Australian store. At the center of the large promotional graphic are three Smashwords books - Kirsty Moseley's Always You, Isabelle Rae's When Summer Ends and Chanda Hahn's The Iron Butterfly. Two of those books are today among the top 10 bestsellers in the Australian store. Congrats to Kirsty and Isabelle! Once the customer clicks the promotional image, they're guided to the special Breakout Books promotional catalog organized around the following categories: Top Picks; Latest Releases; Free; Romance; Young Adult; Crime & Thrillers; Sci-Fi & Fantasy; and All-Time Bestsellers. This special promotional catalog, which for two weeks will receive top-of-store promotion in their Featured Books section, includes titles sourced exclusively from Smashwords. After the initial two week promotion, the catalog may become a regular feature in the Australia and New Zealand stores, providing yet another path for iBookstore customers to easily discover, sample and purchase Smashwords titles. We've gathered some of our highest customer-rated books, all of which are $4.99 or less (many are actually free). Following in the footsteps of Fifty Shades of Grey, all are independently published directly to the iBookstore. Apple has always been amazingly supportive of our authors, but this promotion takes their support to a new level. Of all 50 territories in which Apple operates their iBookstore, Australia is the second-largest-selling iBookstore for Smashwords authors. How can you get your books included in this catalog? First, make sure your books are distributed to Apple through Smashwords. Next, this promotion includes books priced $4.99 or below, so if your books are priced higher they won't make the catalog. Beyond these first two steps, the decision is up to Apple and its customers. However, there is more you can do to maximize your chances of inclusion if you're not included already. This new Breakout Books catalog appears to give preference to books with great reviews and strong sales. Do what you can to encourage your fans to purchase and review your books at Apple. Since millions of readers shop at the iBookstore, make sure your fans know your books are available there. This can involve simply listing hyperlinks to your books at Apple on your website, blog or in other social media outlets. In my previous post, How to Sell Books at the Apple iBookstore, I shared tips. Based on my observations, Apple's merchandising decisions appear to be both customer-driven and editorial-driven. By customer-driven, I mean that the more Apple iBookstore customers who purchase and review your book, the more visible your book becomes in the store. Sales increase your sales rank, which leads to greater visibility and more sales, more "People who bought this also bought this" automated recommendations, and great reviews drive sales as through reader word-of-mouth. By editorially-driven, I mean that the Apple merchandising team hand-selects quality books that meet the interests of their customers. If Apple observes that its iBookstore customers are responding well to a title as measured though purchases and customer reviews, they're more likely to to give a book extra promotion. If an author has performed well with previous titles at Apple, their new titles are more likely to get attention. All of this is pretty much common sense, and not really different from how other retailers merchandize. The reader is king, and all else flows from there. What's different here, however, is that Apple has thrown some serious promotional weight behind this. To determine if your book is in the promotion, from your iPad, iPhone or iPod Touch, sign in to the Australia or New Zealand iBooks app on your device. To learn how, see my November 1 tip in Site Updates for how to view Apple stores in different countries. If you don't have an iPad, iPhone or iPod Touch, consider adding one to your Christmas stocking-stuffer wish-list! The promotion might also be viewable in iTunes, but I haven't had a chance to personally confirm that yet. Who are some of the many Smashwords authors included? Here are some random names, in addition to those mentioned above: Denise Grover Swank, Elisabeth Naughton, Lacey Weatherford, Quinn Loftis, Kira Saito, Danielle Girard, David Dalglish, R.L. Mathewson, Ranae Rose, Oksana Vasilenko, Adrianne White, Julie Ortolon, Derek Ciccone, Autumn Dawn, M.H. Strom, L.L. Bartlett, Ruth Ann Nordin, Ellen Fisher, Lucinda Brandt, JD Nixon, Marquita Valentine and hundreds and hundreds of others. My thanks to Apple for giving so many Smashwords authors this great opportunity to connect with new readers, and my thanks to Smashwords authors and publishers who earned this opportunity by writing books that have pleased so many thousands of iBookstore customers. HI Mark, this is great! I was wondering if there is a way to check exactly which authors ar included? I can't figure out how to check the Australian and New Zealand store - I'm in the US. Thanks! Great news, Mark. I checked the Australian and New Zealand stores and they had 23 of my ebooks offered for sale or for free. I see the Smashwords Forum is testing an updated forum. It looks like the main page will display the Members Ebooks forum prominently. I'm a kiwi writer. How do I get in the list? The sign in button is in the store section. Go to store, bottom of page click on books, at bottom of page it will either have a sign in button or if you are already signed in- it will show your current apple ID. Click there. You can either sign out or click view your ID. I think you can change your your country right then. It would not let me since I have a credit listed in the store ( not sure why that is a problem), however I am going to try create a second ID process described in November. So good to see Apple are supporting Indie authors after the KDP fiasco of recent months. I really hope Apple steps up its support of Indies as there are many who are feeling very let down right now. This is great! 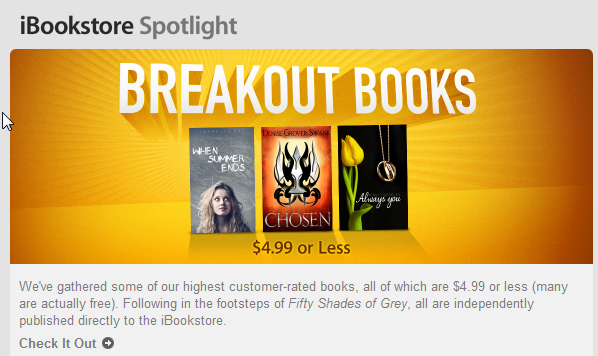 Did Smashwords have a role in making this promotion happen or was it a shot out of the blue by Apple? Such great news, Mark, and congratulations to those who are listed!! Thank you for continuing to nuture such a great relationship with Apple on our behalf, Mark. Apple is definitely doing things right by the Indie Publishing community. @gillian. Here's the full Site Updates (https://www.smashwords.com/about/beta) post from November 1 with the trick: - Fun tip for iPhone, iPad and iPod Touch owners. If you have one of these devices, it's easy to view your book in your country's store, but not easy to view your books in other countries. Until now, that is. I'm going to share a little trick that will allow you to view your book in any country's store. Let's say you live in the US, and want to view your book in the Australia store (which is the #2 Apple store for Smashwords authors, just barely ahead of the U.K. which curiously sells slightly more units but at a lower dollar level). Here's how to check another country. 1. Click to open the iBooks app (of course, if you don't have the iBooks app, download it for free from the App Store). 2. Swipe down to the bottom of the screen. You'll see a button, "Sign in." Click it. 3. The screen will pop up a message asking if you want to "Use an Existing Apple ID," or "Create a New Apple ID." Click the latter one, "Create a New Apple ID." 4. Next, it'll ask you to select the country or region. The default you see is the country you're registered for, which is likely the country you live in. For me, it says United States. If I want to view Australia, I select Australia, then the blue "Done" button. Next, click the "Next" button. 5. The next page shows the agreement. Ignore that, and click the "Cancel" button in the upper left portion of the screen. A pop up box appears, asking if you're sure you want to cancel the creation of a new Apple ID. Click "Yes" to cancel. 6. Voila, you're in the Australian store. @Charles - Do you see a logout button at the bottom, or something that gives you and option to sign in or sign out? @doodlebug - thanks for sharing your additional signon tips. @Justin - First check to see if you're not already on. They're including thousands of our books in the catalog, organized under different filters. Beyond that, see my tips above in the post. Good luck! Hi @derek - I assume you mean some indies feel let down by Amazon, not by Apple, right? Apple has been showing indies great support from our POV, even before this big promo. See my post on "How to Sell Ebooks at the Apple iBookstore" for a chart of SW-author sales at Apple. @oswald. Thanks for confirming this is viewable in iTunes too. @chris Credit goes to Apple's merchandising team in Australia. Conversation went something like this, paraphrased and condensed... Apple: "Your books are popular with our customers. How about if we create a special catalog of your books, and call it something like 'Breakout Books?' " Me: "That would be awesome, yes!!!!" There was more to the conversation, but that captures its genesis. All the credit goes to the Apple iBookstore team for supporting our authors, and to our authors for writing books that please so many Apple customers! When I think about what more we can do to support Apple and our other retailers in the years ahead, I get butterflies. Returning to the fold with some books after two disappointing months with another distributor which now wants to charge me to withdraw. All I can say is, if you want to see selling in action, go with Smashwords. But I would like to see SW go further by increasing the data load for each ebook so we can post pictures. Right now, I can't sell a nonfiction book which has only half the pictures from the print book because of the small file size. Then we could reach readers who like pictures in the mix. Seriously, other publishing services allow up to 20MB. Any chance of that happening? BTW, Amazon is glitching like crazy and indies are pulling out. I have heard a rumor that Amazon is skimming commissions, but that may be a bit extreme. With SW, what you see is what you get. Mark has paid on time every time. That is what distribution is all about. Theresa, thanks for the comments. Re: file size, we'll probably adjust the limit when we launch Smashwords Direct, at least for direct upload .epubs. We'll also reconsider the limit for .doc uploads through Meatgrinder, but that would probably come after SWD. I wouldn't give any credence to that Amazon rumor. I trust Amazon unequivocally to pay what's owed when it's owed, and if they ever made a mistake I'm sure they'd rectify it asap. In this age of extreme transparency, such issues, if they occur, don't go unreported or unresolved for long. Hi!! I just published my first ever book on smashwords and am over half way through the sequel. Im from New Zealand and I REALLY REALLY want to get in this ibbokstore promotion. It would be such a great opportunity! The book is called The Snowball Effect, By Pippa Gordon. A fun adventure fiction with different layers of storyline, a page turner they say...how do I get in!!?? Pip. Thanks so much for including me in your list! Wow, just wow...it's amazing to be a part of this promotion. Again so grateful to you, your very helpful team and Apple for the opportunity! The promotion is viewable in Itunes. I am grateful to Smashwords and Apple for this promotion. It is a Christmas present for me.